Mrs. Gilchrist is a National Board Certified Teacher (NBCT) who has dedicated her life to the education of children. She creates top-notch flipchart lessons and worksheets for elementary school teachers to use in their classrooms. She frequently trains school districts and presents at conferences around the country on using technology in the classroom. Your students will learn all about food chains with this flipchart lesson. 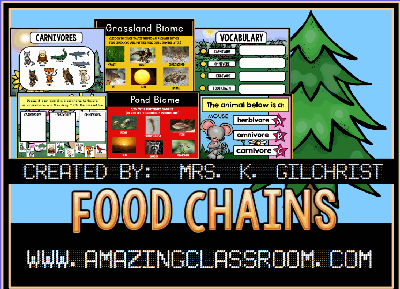 This lesson covers food chains, vocabulary such as: decomposers, producers, primary, secondary, tertiary, and quarternary consumers, herbivores, carnivore, omnivores, and more...This flipchart includes food chains in the grassland, pond, and ocean biomes. There is tons of practice and voting questions are included. Enjoy! Preview only, all flipchart pages may not be shown. 0 comments about this Promethean flipchart.